Gore Windstopper® is a stretchy, breathable fabric membrane that stops the wind. While often found in softshell jackets and pants, the material was chosen by Dynafit to make the anatomically-fitting Radical Windstopper Glove. Add a grippy polyester blend on the palm and sweat absorbing material on the thumb and you end up with excellent high-intensity, cold-weather hand protection. The lightweight Radical is topped off with a Durable Water Repellent (DWR) finish to keep outside moisture outside. Windstopper softshell stretch material is found on the back of the hand and fingers to let moisture out and block the wind. 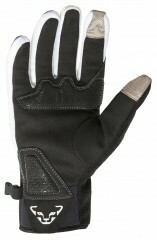 65% polyester / 35% polyurethane blend in the palm makes for a rugged-yet-flexible grip. Chamude and silicone print reinforcements are added in the pole gripping area to extend the life of the glove. E-touch finger and thumb are smart phone compatible so you can check your GPS or tell your spouse you'll be skiing late. Microwaffle inside adds comfort and a DWR finish outside causes water to bead instead of soak in. 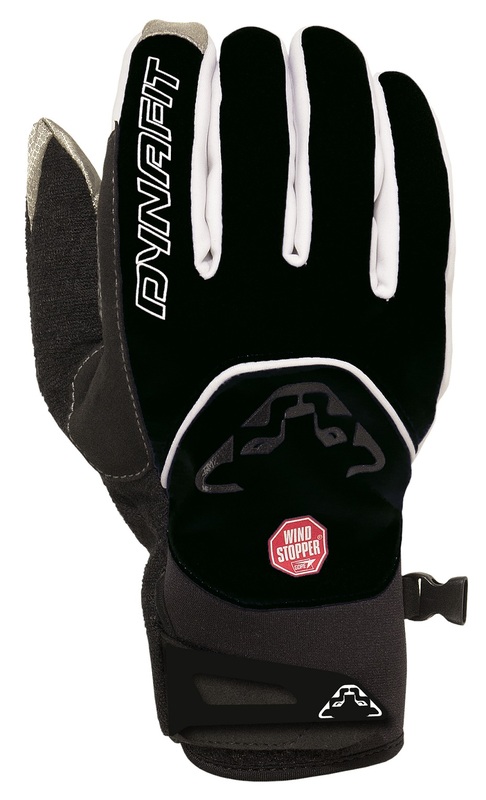 Adjustable cuffs help keep out the snow and an unobtrusive buckle help keep the gloves a pair.